‘Into the Valley of Death, rode the six hundred…’ He had a way with words, that Tennyson fellow. And the Charge of the Light Brigade he was writing about also has a stirring effect on militaria collectors. Charge of the Light Brigade 1854 on offer at the September 30 Laidlaw auction estimated at £10,000-15,000. The famous 1854 action in the Crimean War is one of the best-known British military blunders and it exerts a strong pull at auction, with medals from chargers among the most valuable to collect. 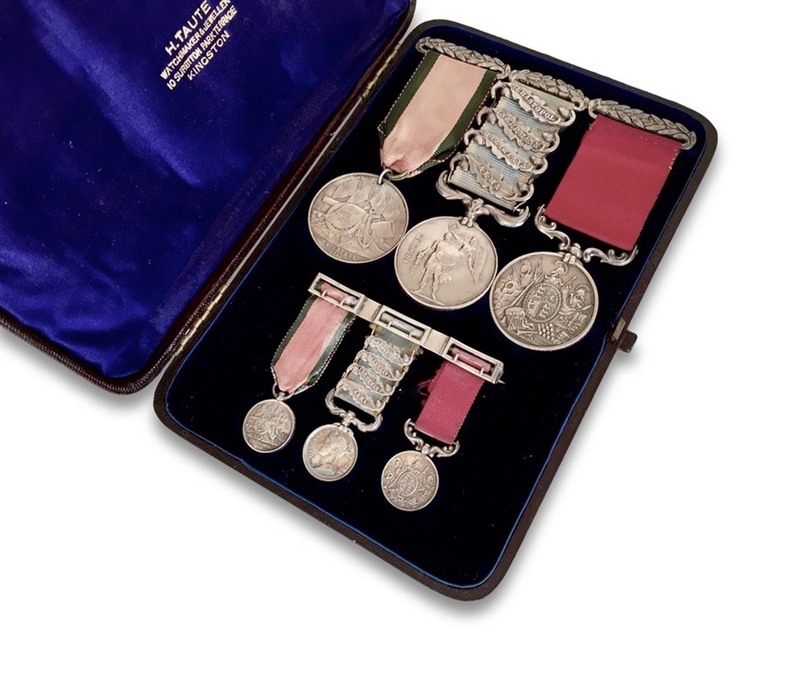 A group of three medals earned by a participant who survived the ‘volley and thunder’ is estimated at £10,000-15,000 at Laidlaw Auctioneers on September 30 in Carlisle. There can be a problem with Charge of the Light Brigade memorabilia: many more people said they had taken part than actually did (a bit more than Tennyson’s six hundred, around 675, although he can be permitted a bit of poetic licence). Auctioneer Paul Laidlaw says: “While more veterans of the Crimean campaign claimed to have taken part in the charge than were actually present, researchers (Lummis and Wynn, Crider, Brighton, Sewell) have arrived at near definitive lists. The group on offer comprises Baker’s Crimea Medal with four clasps (Sebastopol, Inkermann, Balaklava, Alma), a so-called Turkish Crimea Medal and his Army Long Service and Good Conduct Medal. “At or near issue they have been jeweller-mounted on a silver laurel suspender and presented in a fitted case with miniatures,” says Laidlaw, who adds that the vendor wishes to remain anonymous but he can confirm the group “has not previously appeared on the market”. The case is marked ‘H Taute, watchmaker & jeweller, 10 Surbiton Park Terrace, Kingston’. The 4th Light Dragoons saw action, as part of the Light Brigade under the command of Major General the Earl of Cardigan, at the Battle of the Alma in September 1854. The regiment was in the second line of cavalry on the right flank during the Charge of the Light Brigade at the Battle of Balaclava in October 1854 and lost four officers and 55 men. Private Samuel Parkes was awarded the Victoria Cross for saving the life of a trumpeter, Hugh Crawford.